The domain within your query sequence starts at position 27 and ends at position 50; the E-value for the GoLoco domain shown below is 4.05e-6. In heterotrimeric G-protein signalling, cell surface receptors (GPCRs) are coupled to membrane-associated heterotrimers comprising a GTP-hydrolysing subunit G-alpha and a G-beta/G-gamma dimer. 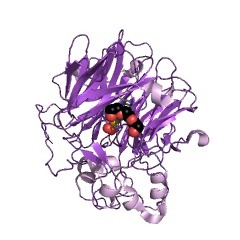 The inactive form contains the alpha subunit bound to GDP and complexes with the beta and gamma subunit. 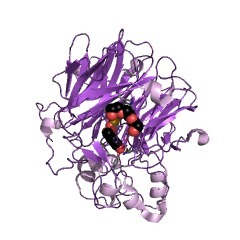 When the ligand is associated to the receptor, GDP is displaced from G-alpha and GTP is bound. 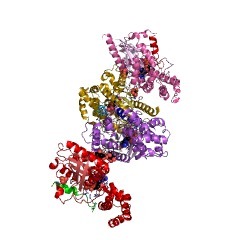 GTP/G-alpha complex dissociates from the trimer and associates to an effector until the intrinsic GTPase activity of G-alpha returns the protein to GDP bound form. Reassociation of GDP bound G-alpha with G-beta/G-gamma dimer terminates the signal. 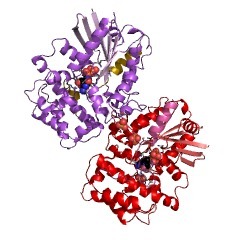 Several mechanisms regulate the signal output at different stage of the G-protein cascade. 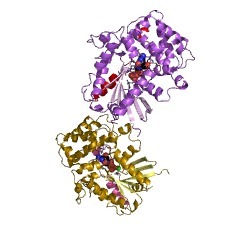 Two classes of intracellular proteins act as inhibitors of G protein activation: GTPase activating proteins (GAPs), which enhance GTP hydrolysis and guanine dissociation inhibitors (GDIs), which inhibit GDP dissociation. The GoLoco or G-protein regulatory (GPR) motif found in various G-protein regulators [(PUBMED:10470031), (PUBMED:10606204)] acts as a GDI on G-alpha(i) [(PUBMED:11121039), (PUBMED:11024022)]. 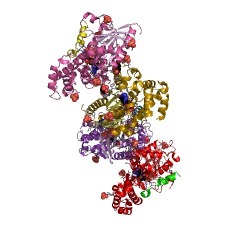 The crystal structure of the GoLoco motif in complex with G-alpha(i) has been solved [(PUBMED:11976690)]. It consists of three small alpha helices. The highly conserved Asp-Gln-Arg triad within the GoLoco motif participates directly in GDP binding by extending the arginine side chain into the nucleotide binding pocket, highly reminiscent of the catalytic arginine finger employed in GTPase-activating protein. This addition of an arginine in the binding pocket affects the interaction of GDP with G-alpha and therefore is certainly important for the GoLoco GDI activity [(PUBMED:11976690)]. Mammalian regulators of G-protein signalling 12 and 14 (RGS12 and RGS14), multifaceted signal transduction regulators. 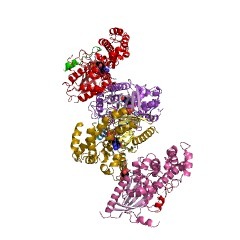 Loco, the drosophila RGS12 homologue. 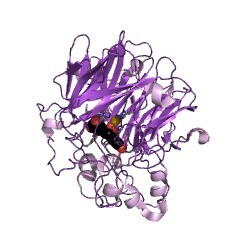 Mammalian Purkinje-cell protein-2 (Pcp2). It may function as a cell-type specific modulator for G protein-mediated cell signalling. It is uniquely expressed in cerebellar Purkinje cells and in retinal bipolar neurons. Eukaryotic Rap1GAP. A GTPase activator for the nuclear ras-related regulatory protein RAP-1A. Drosophila protein Rapsynoid (also known as Partner of Inscuteable, Pins) and its mammalian homologues AGS3 and LGN. 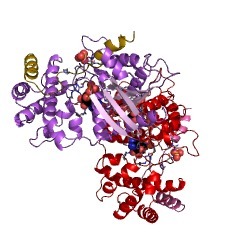 They form a G-protein regulator family that also contains TPR repeats. There are 7862 GoLoco domains in 3705 proteins in SMART's nrdb database. Taxonomic distribution of proteins containing GoLoco domain. This tree includes only several representative species. The complete taxonomic breakdown of all proteins with GoLoco domain is also avaliable. Click on the protein counts, or double click on taxonomic names to display all proteins containing GoLoco domain in the selected taxonomic class. 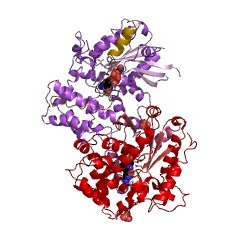 Interaction of heterotrimeric G protein Galphao with Purkinje cell protein-2. Evidence for a novel nucleotide exchange factor. The heterotrimeric G protein Galphao is ubiquitously expressed throughout the central nervous system, but many of its functions remain to be defined. To search for novel proteins that interact with Galphao, a mouse brain library was screened using the yeast two-hybrid interaction system. Pcp2 (Purkinje cell protein-2) was identified as a partner for Galphao in this system. Pcp2 is expressed in cerebellar Purkinje cells and retinal bipolar neurons, two locations where Galphao is also expressed. Pcp2 was first identified as a candidate gene to explain Purkinje cell degeneration in pcd mice (Nordquist, D. T., Kozak, C. A., and Orr, H. T. (1988) J. Neurosci. 8, 4780-4789), but its function remains unknown as Pcp2 knockout mice are normal (Mohn, A. R., Feddersen, R. M., Nguyen, M. S., and Koller, B. H. (1997) Mol. Cell. Neurosci. 9, 63-76). Galphao and Pcp2 binding was confirmed in vitro using glutathione S-transferase-Pcp2 fusion proteins and in vitro translated [35S]methionine-labeled Galphao. In addition, when Galphao and Pcp2 were cotransfected into COS cells, Galphao was detected in immunoprecipitates of Pcp2. To determine whether Pcp2 could modulate Galphao function, kinetic constants kcat and koff of bovine brain Galphao were determined in the presence and absence of Pcp2. 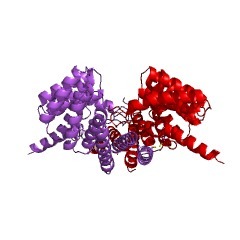 Pcp2 stimulates GDP release from Galphao more than 5-fold without affecting kcat. These findings define a novel nucleotide exchange function for Pcp2 and suggest that the interaction between Pcp2 and Galphao is important to Purkinje cell function. The GoLoco motif: a Galphai/o binding motif and potential guanine-nucleotide exchange factor. Identification and cDNA cloning of a novel human mosaic protein, LGN, based on interaction with G alpha i2. We have used the yeast two-hybrid system to identify proteins that interact with the alpha-subunit of the heterotrimeric GTP-binding protein, Gi2. We screened a human B cell cDNA library with full-length G alpha i2 and isolated four positive colonies, one of which expressed the 44-kDa COOH terminus of a previously unrecognized 677-amino acid (aa) protein. A full-length clone was isolated from a HeLa cell cDNA library. The deduced protein contains 10 Leu-Gly-Asn repeats, and thus we named it LGN. Computer analysis indicates that LGN is a mosaic protein with seven repeated sequences of about 40 aa in length at its N-terminal end, and four repeated sequences of about 34 aa at its C-terminal end. Each of the two repeat regions shows substantial similarity to proteins found in other organisms. RT-PCR analysis of human tissues showed that the mRNA of LGN was ubiquitously expressed. The specificity of interaction between G alpha i2 and LGN was confirmed by an in vitro binding assay using recombinant proteins. These data indicate that the yeast two-hybrid system can identify novel proteins, such as LGN, that interact with G alpha proteins. As a mosaic protein, LGN shows similarity with portions of proteins from many species and thus may define a new protein family. 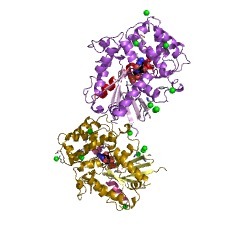 3onw Structure of a G-alpha-i1 mutant with enhanced affinity for the RGS14 GoLoco motif.